WhiteCoat Clipboards® has designed a full size clipboard for all nursing professionals to use while taking care of patients. Our unique patented design allows you to fold the clipboard in half for storage in your pocket, white coat or scrub pocket. 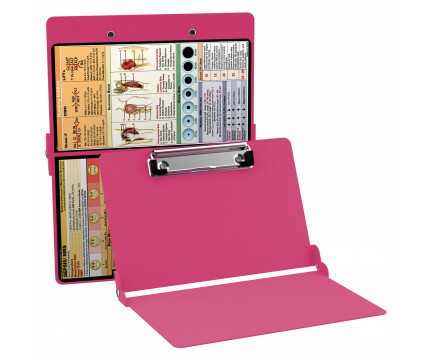 This folding clipboard is made of lightweight aluminum and has the ability to carry 30 pieces of paper without a crease and securing all your medical information inside. Carry patient assessment forms, nursing protocols, medication lists, and all your documentation in a HIPAA compliant secure folding clipboard. 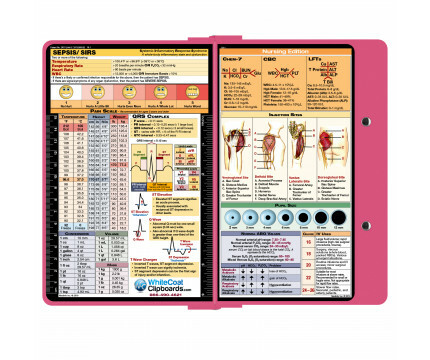 The nursing label applied to the outside of the clipboard functions as a quick medical reference guide with detailed day-to-day information such as basic laboratory values, acid base determination, injection sites, pain scale, and much more. To see all the nursing specific information on this clipboard, hover over the clipboard images above to display high resolution details. Order today to get the latest 2019 Nursing label! Make sure you get the perfect clipboard for you! Click here for our other Nursing WhiteCoat Clipboard colors!